Your dining experience here at the hotel begins with a delicious breakfast buffet on the 2nd floor. If you fancy a bit to eat while waiting for your flight, then head to the Living Room on the 3rd floor. And for a great meal with spectacular views, take the elevator up to our Kitchen & Table restaurant on the 12th floor. Our generous breakfast buffet ​is served at our Runway restaurant on the 2nd floor. Conference guests can also enjoy delicious lunches and dinners here. Head up to the 12th floor, where you'll find Kitchen & Table by Marcus Samuelsson. 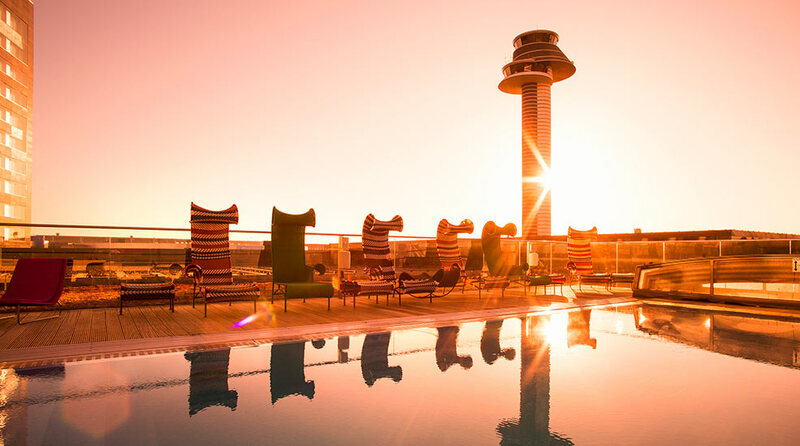 Against a backdrop of stunning sunsets and sweeping views of the airfield, our penthouse restaurant serves authentic Manhattan flavours using only the finest Swedish ingredients. It is perhaps only natural that a restaurant wanting to combine the flavours of two different worlds should end up at Arlanda. After all, where better to experience a natural fusion of the world's cuisines than at an airport? On weekdays, guests can enjoy a great lunch menu at Kitchen & Table. We recommend you to try our daily special for 135 SEK. On Saturdays and Sundays, we serve a selection of dishes from our à la carte menu. Everyone working at Arlanda Airport and wearing an Arlanda Friends badge will pay just 95 SEK for the daily lunch special. Our dinner menu is influenced by Manhattan, with modern and cross-border combinations where the inspiration comes from international and traditional cuisine. View our menus here. Welcome to our the Clarion Living Room – a place to be inspired by art, music, design and, not least, other people. Our ambition is that you might sometimes feel you’d rather be in our living room than your own! Enjoy something to eat and drink and, if the weather's good, you can even step out onto the terrace for a coffee in the sun. More information about our events in Living Room can be found here.